The typical critical clichés used to praise thrillers are overused expressions like “pulse-pounding” or “a white-knuckle ride.” The superb A Most Wanted Man can’t be described with those adjectives, but that’s because director Anton Corbijn’s film is colder and more cerebral—and yet, when the film reaches its final stretches, it’s extraordinarily gripping. 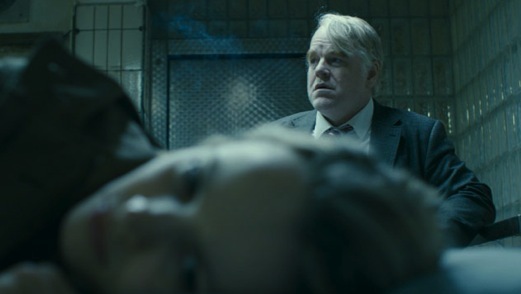 The film’s confident tonal control is a compliment to Corbijn’s skill, but it’s also recognition of Philip Seymour Hoffman’s wonderfully controlled central performance. You don’t realize how stunning the whole experience really was until it’s over. Based on a John le Carré novel, A Most Wanted Man takes its time to tell its tale, focusing first on character and atmosphere before turning to plot. Living in Hamburg, Gunter (Hoffman) works for a branch of German intelligence that’s essentially unauthorized, tasked with hunting down possible Islamic terrorists and trying to ascertain possible homeland plots. Something happened years ago to Gunter when he ran a station out of Beirut—something we don’t learn about and which he doesn’t want to discuss—but the memory of that unspecified failure still galls him. His latest tip leads him to Issa Karpov (Grigoriy Dobrygin), a man of Chechen and Russian heritage living in Germany. Due to receive a rich inheritance from his father, Issa is suspected of being a jihadist by international watchdogs, but Gunter isn’t convinced. His team intercepts Issa’s lawyer, Annabel (Rachel McAdams), who’s trying to help keep him in Hamburg legally. (She fears what will happen to him if he’s sent home, where Russian federal officers viciously tortured him.) Gunter coerces her into being his mole—he wants to see if Issa will donate his money to Faisal Abdullah (Homayoun Ershadi), a respected Muslim scholar who, Gunter believes, has connections to terrorist groups. To Gunter’s mind, Issa is immaterial: He wants to take down the major players. Working from a script by Andrew Bovell, Corbijn works in a similar vein to his underrated George Clooney thriller, The American. In that film, the excitement of the world of assassins and spies was intentionally undercut by the director’s interest in the isolation and spiritual anguish of his main character. But if The American could be accused of being too self-consciously chilly, luxuriating in its own anomie, A Most Wanted Man does a better job juggling plot mechanics and character study. Though the film starts slowly, A Most Wanted Man is merely taking its time to map out the complexity of its narrative. Beyond the collection of characters already mentioned—each given time to feel multi-dimensional—there is also a local banker played by Willem Dafoe who will be integral in Gunter’s plan and a savvy CIA agent (a wonderfully icy Robin Wright) who wants to poke her nose in Gunter’s operation simply because she represents America’s overweening intelligence community. (A Most Wanted Man has no compunction about treating the U.S. as one of its chief villains.) As we’ll come to understand, no one in A Most Wanted Man is there to blend into the background: Everyone’s there for a reason, so it’s important to pay attention from the start. But the key to the film is Hoffman. Le Carré made his name deglamorizing the spying life, and the actor is magnificent playing a tired, determined agent who long ago lost any illusions about his job. If it’s at first jarring to hear Hoffman use a German accent, soon it feels natural—just as natural, as fact, as his potbellied frame, which is almost a comedic counterpoint to the few scenes in which Gunter has to run after people. There are no James Bond-style sleek action sequences in A Most Wanted Man. (Upon reflection, I’m not even sure there’s a single gun drawn in two hours of film.) Instead, for Gunter there’s just the tough, draining work of trying to get to the bottom of Issa’s motives while arguing with German and American forces that want to take the case away from him. Hoffman makes you feel the man’s exhaustion and frustration, the irritation of trying to do the right thing despite all the people who try to get in his way, even though they’re all supposedly on the same side. This is Corbijn’s most ambitious project—his debut was the quite fine Ian Curtis biopic Control—and he does an excellent job of provoking steely performances from a large cast. This is some of McAdams’ best work in far too long—tough and compassionate at the same time—and even an old pro like Dafoe seems to be reaching down a little deeper to produce something memorable. A Most Wanted Man may be less flashy in design than Corbijn’s first two films, but in its place is a terrific sense of bitter resignation that seeps through every frame. The spy game hasn’t gotten any more thrilling in the wake of 9/11, only more urgent and tense. And as this movie argues, in such an environment trying to be the good guy may end up meaning precious little at all. Tim Grierson is chief film critic for Paste. You can follow him on Twitter.